We can define iterative adentification as a process of almost self-perpetuating reincorporation without recuperation. With image macro memes, the first order is to substitute content with context. The context may remain the same, but the content has been altered to produce, at times an increase in severity, to play at an irony that still maintains, if not requires an understanding of the original context of the appropriated image. We can take the Condescending Wonka image macro as a an example. Yes, Willy Wonka, at least in Gene Wilder’s portrayal of the character, is smug, sarcastic and condescending to his invited guests. What occurs in the meme is an inflation of this attitude that distances itself from the original content through substitution. It is interesting to note that in the scene from which the source image of the meme is lifted, the character of Willy Wonka is neither sarcastic or condescending; in fact, the image comes from a scene in which Wonka demonstrates both humility and pride around the invention of the “everlasting gobstopper” mechanism. That said, it should be noted that the Condescending Wonka meme is in fact a second order variation of an earlier meme — Creepy Wonka — which did maintain a more direct, albeit vulgar connection to the content of the appropriated scene. In the scene from the film, Wonka is about to reveal the machine that makes the “everlasting gobstopper.” When his guests ask what the machine does, Wonka asks in return, “Would you like to see?” The Creepy Wonka meme took advantage of this provocation, replacing the actual verbiage from the scene with the text, “Close the door. 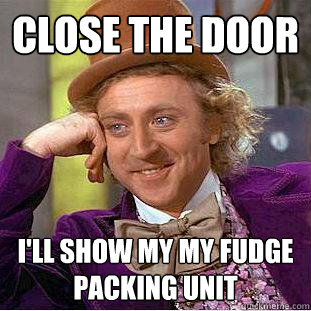 I’ll show my my [sic] fudge packing machine.” Though this macro is the first to use the image, and does have a more direct link to its source material, it is the Condescending Wonka meme, the second order meme as it were, that transformed macro to meme. 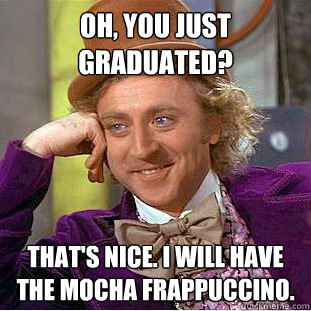 We could be tempted to chalk up the success of Condescending Wonka to a reduction in scatological content, but there are plenty of successful image macro memes that are at least as vulgar. Perhaps then, the success of Condscending Wonka is based on a different kind of rhetorical transfer. To understand the context of the Condescending Wonka meme, one must have an understanding not just of an individual instance in the film, but a more generalized understanding of Wilder’s portrayal of the character. Where the Creepy Wonka meme plays rather simply at a momentary perverse condition, Condescending Wonka allows the attitude of the character to operate as a sublimated vehicle for humorously couched insolence.